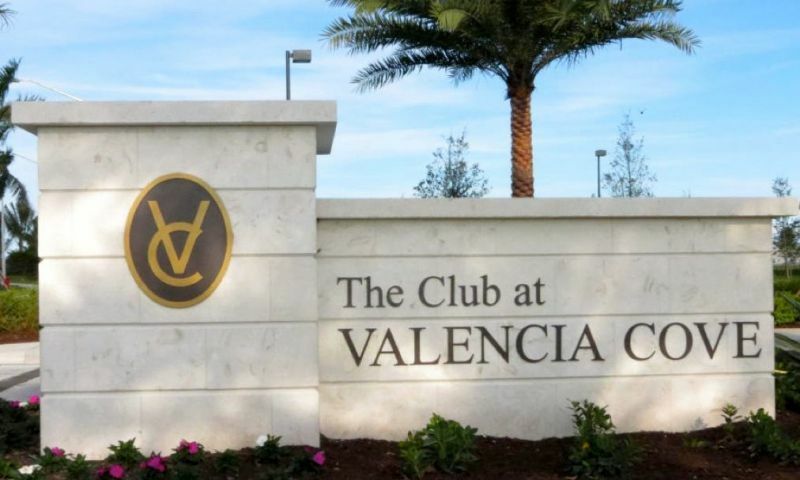 Valencia Cove is a luxurious 55+ community located in Boynton Beach, FL. Active adults can enjoy well-crafted single-family homes designed by GL Homes. Homeowners can experience a maintenance-free lifestyle with resort-style amenities that's conveniently located to plenty of attractions and major highways that will make this age-targeted community one of the most sought after in the Palm Beach County area. Residents can enjoy a fabulous 10-acre recreation complex where all of the social and physical activities are held. The Club at Valencia Cove is a 39,000 square-foot clubhouse that features a state-of-the-art fitness center, yoga and exercise rooms, steam and massage rooms, an indoor and outdoor cafe, four card rooms, billiards room, arts and crafts studio with kiln, catering kitchen, demonstration cooking studio, and a grand ballroom with a stage and dance floor. Homeowners can visit the tennis pro shop to ensure they have the latest gear before their next match. Outdoor amenities offer plenty of options for residents to choose from, such as swimming in the resort-style pool, lap pool, or resistance pool. They can relax in the whirlpool spa, play with the grandkids in the wading pool or just relax on the spacious patio under a cabana. Residents who want more physical activity can do so with eight Har-Tru tennis courts, four pickleball courts, two handball courts, two bocce ball courts, and a half basketball court. Residents can also enjoy scenic strolls along the walking trails that are found throughout this beautiful neighborhood. GL Homes built 823 single-family homes in Valencia Cove. These homes offer spacious floor plans that have been designed with active adults in mind. With first-floor living and open floor plans, these homes offer practical living for years to come. You also can have peace of mind knowing you are investing in a quality home, as GL Homes is one of the best builders around for 55+ and active lifestyle living. Exterior maintenance of the homes as well as general up-keep of the community grounds is covered by the homeowners association fee. Homebuyers can choose from a variety of floor plans within three collections such as the Signature Collection, Vintage Collection, and Crown Collection. These homes range from 1,550 to 3,273 square feet of living space with two to five bedrooms, two to four bathrooms, and an attached two or three-car garage. Each collection offers distinct features and unique designs that are sure to please active adult homebuyers. Valencia Cove has an active and social lifestyle for 55+ residents. They take part in scheduled fitness classes or meet with some friends for a game of bridge, poker, or mah jongg in the card room. Active adults can also enjoy activities such as pickleball, billiards, ballroom dancing, golf leagues, yoga, and Zumba. Valencia Cove is staffed with an activities director that will help plan and organize events for residents to attend like music shows, cooking classes, and fishing club. Whether you want to improve your tennis game by practicing with the tennis pro or relax in the resort-style pool there will always be something to keep any active adult busy. Active adults living in Valencia Cove will enjoy easy access to many attractions and shopping options. There are plenty of restaurants and stores less than 23 miles away, such as Canyon Town Center, Delray Marketplace, Boca Town Center Mall, and Super Target. Plenty of beaches for fun in the sun are within 20 miles of Valencia Cove as well like Boynton Beach, Spanish River Park, Boca Raton Beach, and Delray Beach. Other nearby attractions includes golf courses, museums, and medical facilities. Driving around town is a breeze due to the close proximity of the Florida Turnpike and Interstate 95. For farther travel, residents can take flights from Palm Beach Airport that s 20 miles away or Fort Lauderdale Airport that s 40 miles away. Active adults will enjoy all the amenities and social lifestyle as well as the great location at Valencia Cove in Boynton Beach, Florida. The Club at Valencia Cove - 39,000 Sq. Ft. There are plenty of activities available in Valencia Cove. Here is a sample of some of the clubs, activities and classes offered here. Single-family homes within the Signature Collection offer 1,550 to 2,408 square feet of living space. They have two to four bedrooms, two to three bathrooms, and an attached two-car garage. Vintage Collection features single-family homes with 2,301 to 2,786 square feet of living space, two to five bedrooms, two to four bathrooms, and an attached two or three-car garage. Single-family homes within the Crown Collection offer the most space for the active adult homebuyer. They have 2,787 to 3,273 square feet with two to three bedrooms, two-and-a-half to three-and-a-half bathrooms, and an attached two or three-car garage. We purchased our lot and model from the sales office located in Valencia Reserve. Our experience to date has been wonderful. The GL staff make it so easy an experience from the initial purchase thru the home design. Although the standards are excellent, the options are too! We were at the Cove at the end of February and were amazed how much is done. The entrance looks like you're entering a tropical island. We can't wait to see the finished home. We have been so impressed with everything Valencia cove has to offer. We have purchased our lot and chosen our model. With the standards that are included few upgrades are needed. We can't wait to move in! 55places.com is not affiliated with the developer(s) or homeowners association of Valencia Cove. The information you submit is distributed to a 55places.com Partner Agent, who is a licensed real estate agent. The information regarding Valencia Cove has not been verified or approved by the developer or homeowners association. Please verify all information prior to purchasing. 55places.com is not responsible for any errors regarding the information displayed on this website.